Tech analysts predict that 2018 will be a big year for Artificial Intelligence (AI) in all its forms. We’ve reached a point where the virtual assistant on our smartphone can usually understand what we’re saying, devices powered by Amazon Alexa or Google Assistant can be had for as little as $50, and app developers can leverage powerful conversational AI platforms created by Amazon, Google, IBM, and Microsoft (among others) for their own applications. We’re asking chatbots to check our credit card balance via text message, schedule meetings for us, and even act as graduate assistants. AI has many exciting implications for training and L&D professionals. 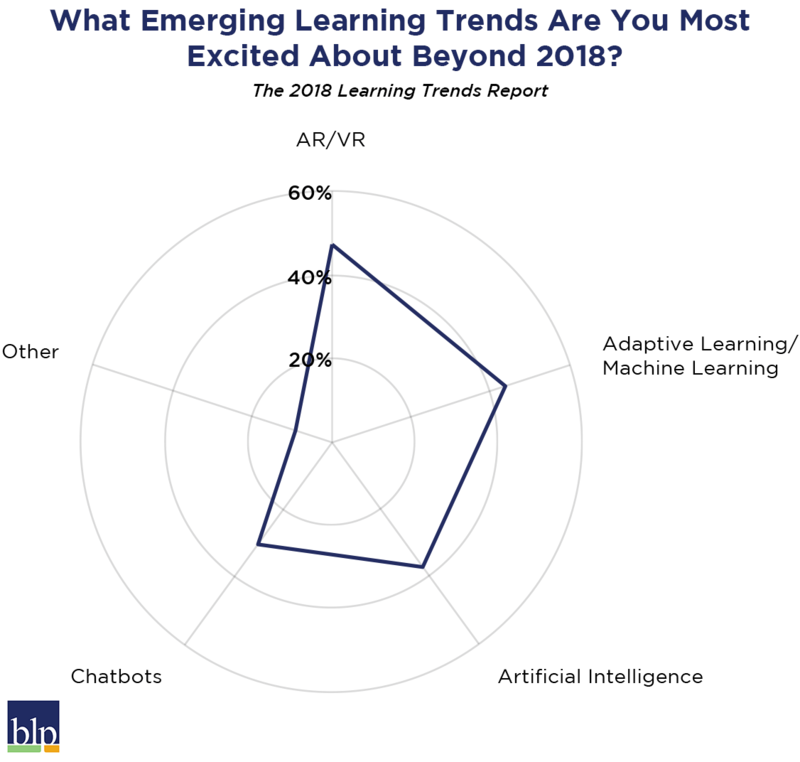 While some are still a bit farther in the future, I’m particularly excited by the potential of chatbots to enhance and improve learning in the near term. We know how to talk, and we know how to email or text message: chatbots allow us to get questions and answers in convenient, familiar ways. The technology is here, the devices are readily available, and there are plenty of use cases where chatbots make sense. With proper up-front design and reasonable expectations, you can skip the gimmicks and implement a chatbot that solves problems and improves the learner experience. By doing so, you’re moving your organization one step closer to a future of AI-driven learning. When I say AI, I’m not talking about killer robots taking over the world. We’re at least decades away from self-aware AI, with no clear roadmap for getting there. Today’s leading AI researchers focus on using AI to automate basic tasks, perform sophisticated data analysis, and spot trends. AI is a broad field that focuses on the development of computer systems that perform human functions. Andrew Ng, Chief Scientist of Baidu and prominent AI practitioner, notes that any task humans can perform with one second of thought or less is a candidate for automation using AI. Machine learning is a subset of AI. It’s generally based off of an algorithm that gets smarter over time the more data you feed it. For example, the posts you see more of in your Facebook feed or the types of songs you hear the most on Spotify are driven by machine learning. Now, computers can even “see” images, categorize them, and spot patterns. It won’t be long before you are able to take a picture of your living room and get personalized furniture recommendations from a computer, for example. Side note: Machine learning holds a lot of promise for L&D… if we can get the data. The big barrier preventing L&D from adopting learning approaches driven by machine learning will be figuring out what data matters and how to collect it at scale from diverse sources. Chatbots are simply computer programs that can understand natural language patterns (written or spoken) and provide useful responses. Years of advances in AI and machine learning, particularly speech recognition and natural language processing, are what make it possible to build a chatbot that can be useful for simple tasks. Basic chatbots have been around for a long time (just ask a child of the 90s – SmarterChild, anyone?). But it was not until recently that conversational AI reached a level of sophistication that made it useful for a wide range of things. Google, Amazon, IBM, Microsoft, and others are making big bets on conversational AI. And the accuracy and usefulness will only increase over time. Thankfully, these companies now allow third-party developers to use their conversational AI for their own applications. Assuming you have access to a knowledgeable developer or two, you can skip the thousands of hours in data science and machine learning work and make a useful chatbot relatively quickly. When Siri came out, it was panned by many. Apple promised the world and marketed it as if you could ask Siri anything and it would be able to help. In reality, Siri was only able to help with a very limited set of applications. An L&D chatbot will be similarly dismissed by your learners if it fails to deliver on its promise. Don’t try to give learners a virtual assistant to help with anything and everything; focus on a single product, process, or topic you want the chatbot to support and build from there. Make sure you clearly communicate to learners what the chatbot can and cannot do, and what questions they can ask. Doing this allows you to “ship” your chatbot quickly and gauge learner reactions before making big investments in large-scale development. And perhaps most importantly, make sure you have lots of learning content around the topic you wish to train your chatbot on! Your chatbot will only be as useful as the data you feed it. With those words of caution out of the way, let’s explore four of the most practical ways you can pilot a chatbot in 2018. 1. Use a virtual assistant like Amazon Alexa or Google Assistant to answer spoken questions from on-the-go learners. You don’t need an Amazon Echo or Google Home to take advantage of a virtual assistant with voice control. Both Amazon and Google allow users to interact with their virtual assistants via smartphone apps. Consider creating an app (or Skill in Amazon terminology) where learners can ask questions about a particular product or process and get quick answers. The use of voice commands would be ideal for on-the-go sales reps in need of a quick answer while driving to meet a customer, for example. 2. Answer common learner questions in a chat window or via SMS. Similar to the first use case, you can also create a chatbot that answers common questions via text. For example, a learner could text the bot a question and receive an answer without having to log into the LMS to hunt for it. You can even program the bot to forward questions it cannot answer to your training team for further support. Think of it as an easy-to-use FAQ that allows you to make it more and more useful over time. 3. Customize a learning path based on learner’s demographic information. At the beginning of a training initiative, a chatbot could be used to ask a series of questions about learners’ current knowledge and skill levels. Based on their responses (many of which could be from a drop-down or list of options to manage complexity), the chatbot would present learners with a customized training plan made up of your learning materials. Depending on your target learners, this type of chatbot might be preferable to filling out a lengthy form. The data gathered also allows you to provide a training experience that is personalized to each learner’s unique needs. 4. Use a chatbot to assess learner knowledge. A chatbot could be used to ask a series of questions, either via text or spoken word, and record learner responses. By using multiple choice questions, a “Quiz Bot” could be up and running quickly. It could provide learners with a convenient way to review content or prove their mastery of a topic. Responses can be recorded, scored, and compared against other learners to measure results. We had good success with the Mobile Coach chatbot and a safety program. The technicians were unsure at first but really started getting into it. We saw an improvement in safety incidents and technicians reporting that the company cared about their safety on an engagement survey. We considered it a win! I have been speaking and developing in this arena for the past year. We are just starting to foresee the potential impact on performance support in the home and workplace. Alexa now supports private business accounts and multiple users per device, so the revolution is underway. I am happy to discuss the future of conversational learning just drop me a line.